The Rigid D Series Dually D2 HD Line of LED Lights is one the most versatile and built to last products available in the lighting market today. This heavy duty version of the Rigid Industries Dually D2 deatures a larger and thicker mount made of stainless steel with a vibration isolator. This mount was designed specifically with heavy equipment in mind. The extra thick and durable housings feature custom oversized heat syncs to keep the temperature down and keep the light functioning continuously for long periods of time. Each light is finished off with a polycarbonate unbreakable and scratch resistant lens. These features are the reason that Rigid Industries lights are time and time again the first choice for off road, industrial, construction, and other high demand atmospheres. 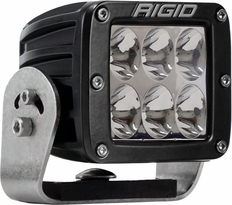 If the durability aspect of the Rigid Industries Dually D2 HD Lights didn�t sell you, their performance will. Rigid Industries patented specter optics system is designed to produce intense smooth light with minimal wasted light. Rigid Dually D2 HD LED Lights have an excellent light output to power draw ratio and will easily outshine and outlast the competition. Each Dually D2 HD LED Light draws 3 Amps and 42 watts. Light output is 4752 raw lumens from the 6 high output LEDs.